If you have a small parking garage or if you often park in public parking garages then door guards can be saving you money right now. Do you have trouble parking your car or cars in your home garage? Do your kids often accidently open your car door into the wall or your other vehicle? 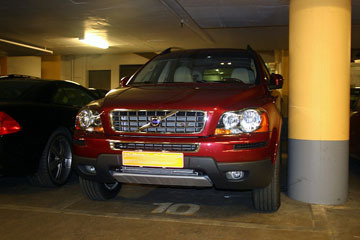 By using car door guards you wont have to worry about door dings caused by tight parking. Car door edge guards protect the paint on the edge of your doors from being chipped when they come in contact with a parking garage wall or another vehicle. Notice how tight the parking garage space is in this photo. The drivers side of the Volvo is way too close to the column and the black car next to it is parked very close which will almost definitely result in a door ding. In these situations its best to use car door protectors and door edge guards so you wont have to worry about any parking garage damage.